Selling our IN HOUSE DEMO UNITS. 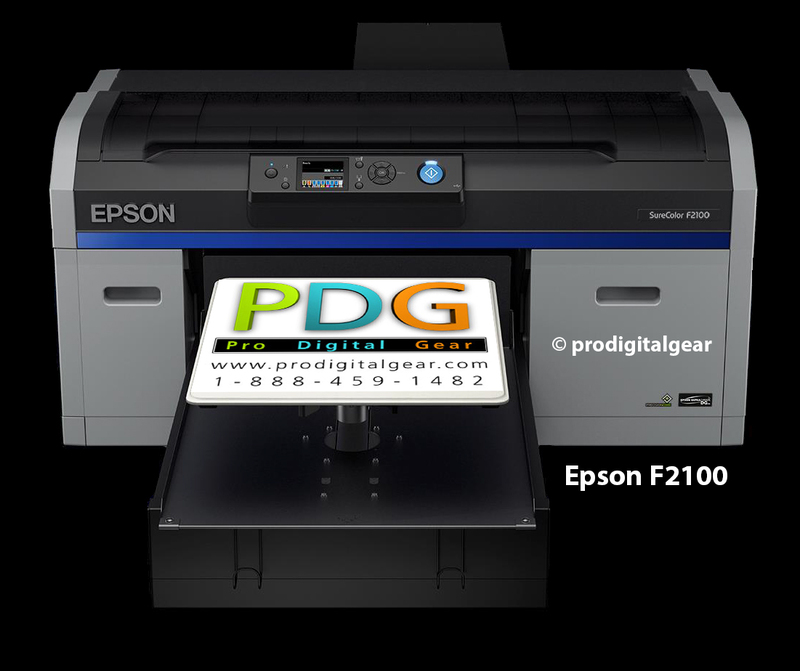 Epson F2100 sold with FULL ONE YEAR EPSON WARRANTY AND expandable for another TWO YEARS. (The dealer is able to use a printer for up to 6 months and then sell with full warranty) This one was in our demo room for 4 months. Remember, with a new unit you get starter set of inks which barely fills the system. THIS unit has 600ml inks in it and the levels are high. Most at 3/4. Currently 415 pages, but that goes up a couple a day. Price of $16995 is for package deal shipped to continental USA. That is the Epson F2100 (New $15495.00), Pearl Elite ($3995.00) George Knight Press ($1395.00) Approx 3/4 level of 600 ml ink -6 carts ($969.00)totaling over $20K...save thousands. Will sell separate and relist with individual prices, IF someone buys just the printer. Every three months we take in a new printer, new pretreat machine and heat press from different manufacturers. We use them to demo for client and also for our how to YOUTUBE videos. Leasing available. Sold by authorized Epson, Pearl, George Knight dealer. PICKUP AND SAVE- CERTIFIED CHECK SAVES another 2% Located in CT. Heck...pickup and bring a cert check and save another $1000 on the package. How's that? for more info or to schedule a demo on this package.